There really is no good reason to review a Wii U launch game this late in the game, especially one that was released earlier for other consoles. That said, we'd be remiss if we didn't talk about this game at all on SuperPhillip Central. It's Darksiders II. Darksiders II released on PlayStation 3, Xbox 360, and PC back in August of last year. Since then, the publisher of the game, THQ, went under and sold off all of their assets. 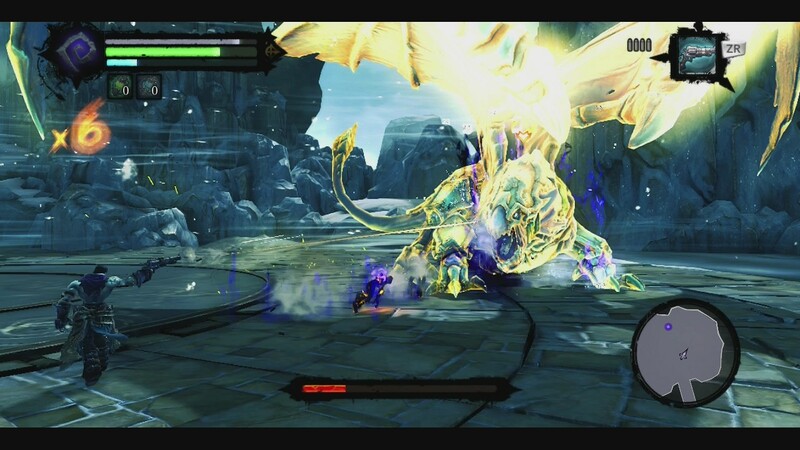 Before that event, however, Darksiders II found its way onto Nintendo's Wii U just in time for the system's launch. Was becoming Death, destroyer of worlds, close to three months after the original PlayStation 3, Xbox 360, and PC release worth the wait? In a time where humanity has been wiped out from the earth and War is being tried for his crimes, Death believes in his brother's innocence. He will do anything to prove it too, such as tackling colossal beasts tainted with Corruption. In order to right his brother's name, Death must restore humanity. If that sounds like a great undertaking, that's because it is. Death is a Horseman with a bit of an arrogant side, and playing as him isn't the most interesting task in the world. That said, he does beat the generic War, at the very least. visits on his quest to save War. 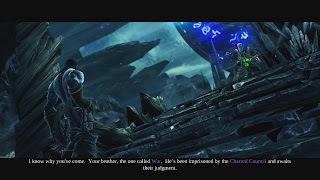 If I had to say what Darksiders II is, it would be a cross between the adventuring, exploring and puzzle-solving of The Legend of Zelda series; the wall-running and climbing of the Prince of Persia series; the combo-happy combat of the God of War series; the massive amount of loot-nabbing of Diablo. It sounds like a match made in Heaven (or I guess, Hell would be a more apropos analogy, considering we ARE talking about Death), and for the most part you would be right in thinking that. 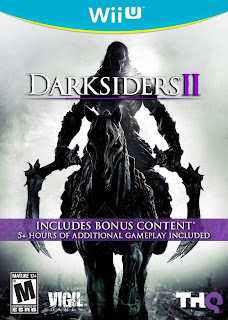 The world of Darksiders II is wide open for Death to traverse his horse on, coming across treasures, dungeons, and optional areas. Areas are interconnected, and there are several different maps Death wades through, from areas representing Earth to a kingdom of lost souls. These areas are quite vast, making riding Despair, his trusty steed, a suggested activity. Like The Legend of Zelda, Death comes across various items in several (but not all) of the dungeons in Darksiders II. For instance, the Death Grip serves as a grappling hook of sorts to cross over large distances, as well as pull faraway objects to Death. Then there's the Voidwalker, which makes its return from the original Darksiders. This item acts like the gun from Portal, only the Voidwalker can only be used on specific targets to create portals instead of being able to be used anywhere. Finally, there's the Soul Splitter ability, that grants Death the ability to split into two playable characters, only one being able to be moved at the same time. Some pretty clever puzzles revolve around using the two in conjunction to progress. For example, one steps on a pressure plate that opens a gate for the other to pass through. be found in Darksiders II. As for the puzzles, they can range from insultingly easy to maddeningly hard, though it is usually the former rather than the latter. Dungeons are generally the locations where puzzles exist, and although there are a lot of them in Darksiders II, a fair portion of them are merely retreads of previous puzzle ideas, leading to some great familiarity within the game. The Prince of Persia influences are apparent, with Death needing to find a way up and around stone structures. These ways around are usually easy to spot. For instance, a faded stretch of wall generally means Death needs to run along it, while a wooden ledge is something for Death to grab onto, using multiple ledges, posts and poles to maneuver around walls and to cross chasms. Combat consists of locking onto enemies, switching foe focus by using the right stick, dodging and evading while waiting for windows of opportunity to attack. A lot of battles can simply be won with an appropriate amount of tedious button-mashing, but some enemies will absolutely annihilate Death if all he does his thrash about with his scythes. Many of the larger enemies merely come off as meat shields, having obnoxiously large amounts of health to whittle down, slowly but surely. However, most of the time you're facing grunts, and the odds are definitely not in Death's favor. Become Death, destroyer of enemy fodder. Dropped from enemies and found in the myriad chests sprinkled throughout Darksiders II's worlds, MMO-style loot is common. As you stand over a new set of scythes, a subweapon, pieces of armor, or a talisman, the stats for it appear on the screen. Stats that increase are shown in green while stats that decrease are in red. There are a seemingly infinite amount of equipment combinations to possess, and each are shown on Death's body in real time. Go in guns blazing with Death. Concerning subweapons, it's really a matter of deciding whether you want power or speed. Yes, a giant axe that does massive amounts of damage is great, but it leaves Death open to attacks much more than, say, a set of fast hitting claws. Then again, ten hits from the claws would probably equal one hit from the axe, so there's that to factor in too. As Death completes quests and defeats enemies, he gains experience points, which go into leveling him up. His strength increases, as does his health, defense, and so forth. As Death gains new levels, he gets skill points that can be spent to learn new combat abilities on a skill tree. While Darksiders II borrows from and is apparently heavily influenced by The Legend of Zelda, God of War, Prince of Persia, and any loot RPG, the game is more of a Death of all trades, master of none. 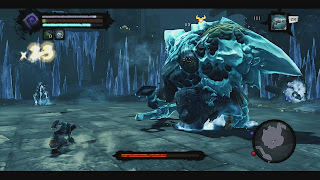 Each gameplay influence of Darksiders II is done better by the series it channels and imitates. 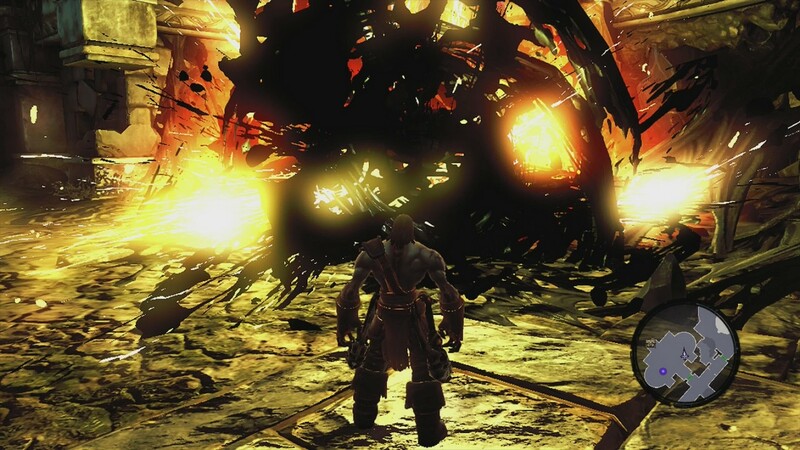 That's not to say there's nothing original or spectacular to be found in Darksiders II. No, it is quite the opposite. It's just that The Legend of Zelda series did not consistently use the rule of threes in its progression, requiring the player to collect three trinkets or destroy three objects before moving on with the story. 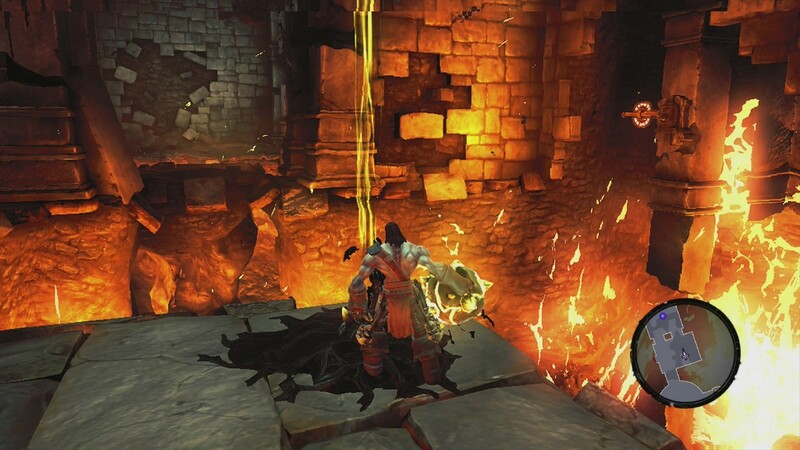 Furthermore, the Prince of Persia series' platforming is much tighter than what is found in Darksiders II, where waist-high obstructions are impossible for the almighty Death to leap over. Pits full of lava? No problem. Bottomless chasms? No problem. aims to take it all out ASAP. Vigil Games stated that they had no problems porting Darksiders II to the Wii U. In fact, they said it took two weeks to get a running build of the game on Nintendo's new system. Perhaps they stopped working on the Wii U port once they got it running on the system in those two weeks, as there are plenty of performance problems to mention. From the screen tearing to the occasional hard locks, to the unexpected loading while walking through a hallway (that seriously couldn't have been masked better? ), to the stuttering, Darksiders II is not optimized to run on the Wii U, and seeing that THQ is now but a memory, there's no way that any patches can be put in place. In addition to all of that, there is no ability to post screenshots via Miiverse. This is unfortunate because I would have loved to share some of the truly amazing locales Darksiders II possesses. What I positively say about the Wii U version, however, is that the game can be played 100% on the Wii U GamePad, or if you choose not to do so, switching weapons has never been easier with the controller. A lot of the bigger enemies are mere damage sponges. 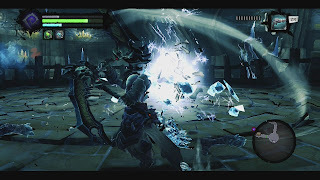 Darksiders II on Wii U is a game marred with presentation problems that makes it tough to recommend over its earlier, and much cheaper, contemporaries. While the game is by no means broken, you can get a better experience on other platforms without the constant freezing, screen tearing, and loading issues. Darksiders II owes a lot to its design to many famous franchises like Zelda, God of War and Prince of Persia, and though it doesn't reach any of those series' levels of quality, it was a compelling enough experience to make me want to see through Death's quest to restore humanity. With Darksiders II, Death will become you, and I can say there are much worse things on the video game market that you can become.